← >Tuesday, town and television! 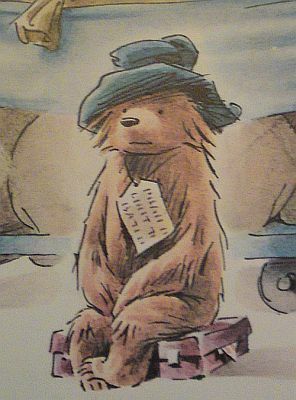 Always identified with and loved the splendid Paddington. ‘Please look after this bear’ says the note. Today, as with the past couple of days… weeks… months?! Has been busy, some good, some bad; but then that’s life really isn’t it? Today my father joined the Facebook world, added and chatted with me; this was both somewhat of a surprise (understatement of the decade) and hopefully a very hopeful thing. We’ve only spoken once in the past 8 years. Another source of heartache and anguish has seemingly ceased, leaving strangely sensitive ripples, (I said ripples Luisa…) in an otherwise quiet, gently ebbing tide. Speaking of driving, this was wyfe2 Luisa fast asleep in the car on the way home from some function or other. Doesn’t she look lovely and peaceful in this very dark and moody shot? Lee came round too tonight, finally feeling just a little stronger after her own dreadful week of hassle and confusion, pain and major medications. It was good to see her smile a little, better to feel her with us again. She’s not doing great, but we had a chat about my going on her insurance too since sometimes she will need running about (she’s been unable to drive this week due to health) and at other times we could borrow the car! I believe we’re long overdue a rain-checked afternoon playing pool together. We have had some other most exciting visitors tonight; Nadia and Nev who are only just now (after a very short sleep!) creeping out in the early hours to drive to Manchester airport to catch a flight to Iceland! This is a bit of a dream trip for them, something they’ve longed to do for some time. We’re keeping the kids busy until they get back; Sophie and Mike are staying with us for the half term holidays, well until Wednesday. Lots of fun, we loves them to pieces we does, Lina’s a very happy bunny and I foresee cinema trips, walks to the park and more. Oh, here’s another in the ‘tea’ series for wyfe1 Rachel!